KATHMANDU, July 1: Paddy plantation across the country is expected to be completed by July, officials of Ministry of Agriculture, Land Management and Cooperatives said. According to the officials, plantation has been completed in 20.2 percent of the rice fields so far. Out of 1.5 million hectares of paddy fields across the country, plantation has already been completed in 311,000 hectares by Saturday. “Data collected across the country shows plantation has been completed in over 20.2 percent of the rice fields till Saturday. By next week, it will reach 35 percent,” Mani Ratna Aryal, the information officer for the agriculture ministry told Republica. “Looking at the current pace, paddy plantation is expected to be completed by July this year,” he added. According to Aryal, plantation is going on in full swing in hilly districts of the country. 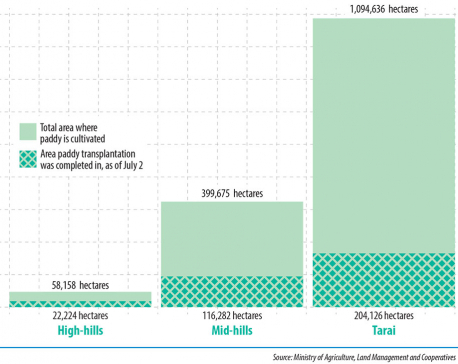 “Many areas in tarai are yet to begin plantation because of low rainfall. Nearly 69 percent of rice field is in Tarai districts. Hilly area is home to 27.5 percent of paddy fields, while some 4 percent of paddy fields are in high hilly areas. Total production capacity of total rice fields in the country is 5.2 million tons. 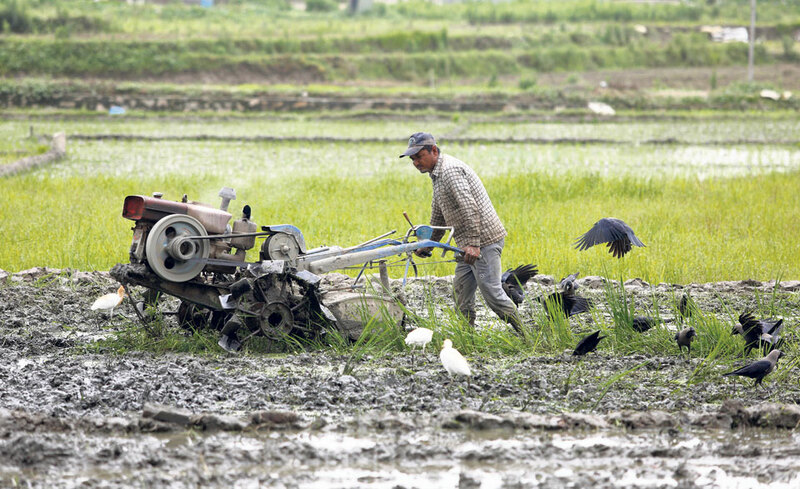 Rice productivity stands at 3.4 tons per hectare, according to the ministry. Agriculture sector contributes 29 percent of the country’s GDP, and the contribution of this crop to agriculture GDP is around 20 percent. While the government has set a target of doubling agro produces within five years, the country is still struggling to become self-sufficient in rice. In 2017, Nepal imported paddy and rice worth Rs 25.7 billion, despite growing 5.2 million tons paddy. As part of increasing agriculture productions, the ministry recently signed an agreement with the Israeli government to introduce modern farming technology from Israel. Similarly, the ministry has also started bilateral discussions with China, Qatar and the Netherlands for technical support in agricultural sector. The ministry has signed a five-year work plan (2018-2023) with International Rice Research Institute (IRRI) of the Philippines to work jointly in seven sectors and 16 major projects for development of agricultural sector.